It is difficult, in the wake of Friday's fixtures in Group D, to find much to be optimistic about from a Scotland perspective. An insipid performance in Tbilisi was bad enough, but in Frankfurt, immediately after that 1-0 victory for Georgia,Germany served up a display against Poland to add another layer of gloom to any analysis of Monday's likely outcome. As Mats Hummels told BBC Scotland afterwards, this was not Germany back to their all-conquering best, but at times against a very good Poland side, they came very close. This was particularly true of the offensive aspect of their play. They swarmed forward, time after time, their incisive passing opening up gaps in the Poland defence. After 20 minutes in the Commerzbank Arena, they had battered the Poles seemingly into submission and the 2-0 scoreline at that point looked like it might become five or six by the end. Thomas Muller, scorer of the first goal, was one of several Germany players on song in that opening period, his languid style belying a sharpness and intelligence that more often than not leads him to be in the right place at the right time in the opposition's box. In Karim Bellarabi, the Bayer Leverkusen winger, Germany appear to have added yet another attacking weapon to their already considerable arsenal. Given his international debut in the defeat by Poland last year, he has become a regular in Joachim Low's line-up and on Friday night showed why. Linking on the left with another relative newcomer - the Cologne full-back Jonas Hector - he gave Lukasz Piszczek, the experienced Borussia Dortmund defender, the run-around, creating Muller's goal and causing havoc. Alan Hutton, or whoever is given the nod by Gordon Strachan at right back, will require support from players in front of and beside him if Germany are not to run amok. Much has been made of the lack of playing time some of Scotland's starters against Georgia had under their belts for their clubs. In the German ranks, a similar issue seemed not to affect Bastian Schweinsteiger and Mario Gotze. The midfielder has started just two of Manchester United's six competitive matches this season, with Gotze starting just once in the Bundesliga for Bayern Munich. Yet both men played significant roles in overcoming Poland. Gotze - nominally playing as a striker - drifted to find space, allowing Muller to fill the gaps left behind. He scored twice - the first a finish from the edge of the box after dancing past Polish defenders on the left of the penalty area - and also struck the post as he sought to reward Low's loyalty in the face of Pep Guardiola's continuing quandary about how best to accommodate him at Bayern. And Schweinsteiger, apparently still trying to adjust to the pace of the English Premier League, prowled the midfield, breaking up attacks, starting lightning counter-movements and generally looking majestic. It's no secret. 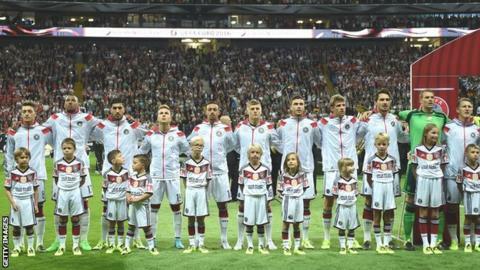 The German side is brimming with talent - and that's without mentioning Toni Kroos or Mesut Ozil! Or indeed Manuel Neuer, who produced two out-of-this-world saves to help ensure the three points stayed in Frankfurt. But there or thereabouts lies the merest chink of light for the Scots. For one of those saves was the result of a wayward clearance from the flamboyant keeper. And he was not the only member of Die Mannschaft to carelessly concede possession or to lose concentration to allow the opposition an opportunity. It happened relatively regularly - sometimes the result of Polish harrying, but on other occasions simply because of a mental or physical lapse by a German player. If Scotland are to take anything from Monday's match, they must surely capitalise on any such failings. The introduction of Hector and Emre Can of Liverpool at full-back looked good from an attacking perspective, but there remains an uncertainty about the German defence. Hummels and Jerome Boateng are undoubtedly excellent defenders, but if their full-backs are caught high up the pitch they can be vulnerable when dragged out wide. These are scraps, though, on which Scotland must attempt to feed. The Germans have a feast of options at their disposal.